Rewards Canada: September 20 Update: 9% cash back returns on TD Cash Back Visa Infiinte, great bonus for flying on Lufthansa, Swiss or Austrian + more! September 20 Update: 9% cash back returns on TD Cash Back Visa Infiinte, great bonus for flying on Lufthansa, Swiss or Austrian + more! If you are thinking of or needing to fly to Europe in November or December check out this bonus offer from Miles & More! 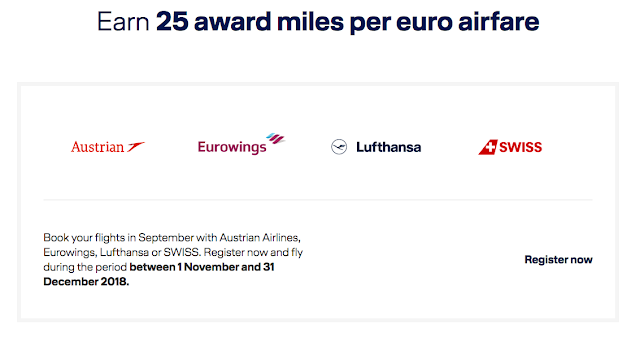 It awards up to 21 bonus Miles & More miles per Euro spent on airfare for travel on Lufthansa, Swiss, Austrian or Eurowings.The normal earn rate is 4 miles per Euro (upped to 5 or 6 if you have Elite status) and this offer boosts the earn 25 miles per Euro spent! Buy a ticket worth 1000 EUR before taxes and fees and you have 25,000 miles! Austrian, Swiss and Lufthansa all fly from Canada so be sure to check them out to see if this offer makes sense for you. The only caveat is that you must book by September 30 for travel only in November and December. Find out more here. - Earn 9% on gas, grocery and recurring bill payments for the first 3 months up to a total spend of $3,500 on the TD Cash Back Visa Infinite Card. More... Must apply by December 3, 2018.